Our mascot, Jake, slung on the bottom shelf of the fridge, haphazardly stuffed into a ziploc bag, looked longingly at me as I pondered dinner this evening. Having risen from an unplanned and extensive Sunday nap, my belly still growling from Mother’s Day Brunch and a week of recipe testing, dinner parties, and severe competition, I couldn’t decide what to prepare. The jar of crunchy peanut butter and the loaf of sourdough rye, well past its best before date, seemed to be a good option. But then, Jake caught my eye again through his ziploc jail cell and I mustered all the energy left in me to do the daunting. 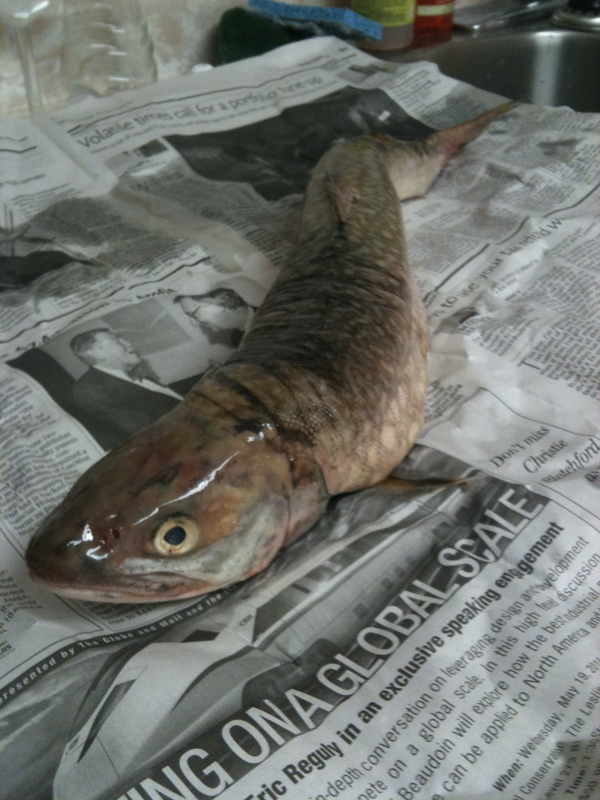 I had not yet gone through the process of cleaning, scaling, boning, and filleting a whole fish. From tooth to tail, I got my hands dirty, carefully unwrapping the perfectly formed specimen. This little, 8lb fish was nicknamed Jake by Chef Corbin on the set of a show that Amanda and I just filmed for the Food Network. Jake became the joke on set, he was coddled by an alarmingly enthusiastic etiquette “expert”, swung like a bat in the kitchen, shown off to complete idiots to help them understand that food is magnificent, and then basically forgotten when we wrapped, and had to whip the set (our friend’s kitchen) back into tip top shape when I threw him into my knapsack. On Thursday afternoon, I had the ultimate pleasure of going to Dufferin Grove market with a production company’s $350.00 to spend on most of the ingredients we needed for our big do on Friday. I had ordered 4lb of filleted splake from Andrew and Natasha Akiwenzie, and asked also for a small whole fish so that we could give our guests a visual of where their food came from. Freshly caught that morning in Georgian Bay, Jake’s eyes glimmering and crystal clear, were ready for a camera debut. I referred to my trusty Fannie Farmer cookbook for the play by play on how to prepare a fish. Step One – cleaning, easy peasy, very little blood, and Andrew had already made the first cut up the belly, so not very difficult at all. Step Two – scaling. At first I couldn’t even tell if their were scales on little Jake. They were so small, and in my dimly lit kitchen I was utterly confused, but after figuring out the correct angle of my dull knives, I quickly got the hang of it and scales were coming out like a golden retriever’s fur in springtime! Unfortunately I have probably the most dull knives in the universe, so Step Three – taking the fins off and boning, proved to be difficult. I finally got preliminary cuts in around the fins, and then ripped them out with my fingers. 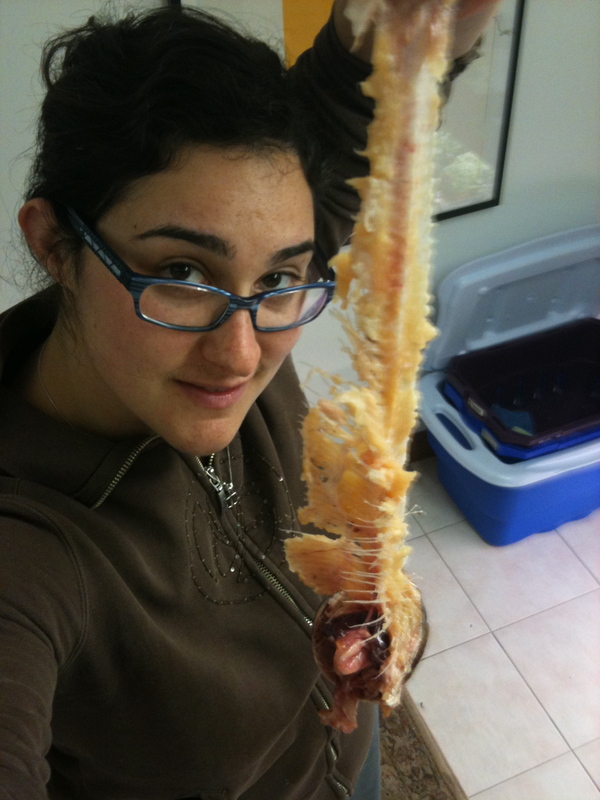 Boning the fish with a dull knife was also pretty awkward. I had to peel away the flesh from the bones, scraping around each one to release it from the fillet. It certainly didn’t end up being two perfect, shiny, smooth fillets fit for Whole Foods, but I did it, and lightly seasoned with salt, pepper, a good rub of olive oil and a sprinkling of rosemary from the garden, I am very pleased with the results! Perhaps this is inspiration enough to arrange a fish and seafood prep workshop. I think that would be fun, and lord knows I could use some serious instruction. Anyone interested? Yesterday I had the pleasure of attending a farmers’ market early in the morning to shop for the ingredients for the rehearsal dinner of an audition for a Food Network Show with Amanda. I was searching high and low for the few key components of a Salade Nicoise. I gave up on that idea though, quickly, since most of the traditional ingredients are totally out of season, so I was on the hunt for alternatives. I came up with the brilliant plan to make a Salade Torontoise. Wee carrots in a rainbow of colours, spicy black radish, sweet red radish, bulls blood beets, Belgian Endive, cucumbers, and smoked whitefish from the Akiwenzies. Just needed some hard-boiled eggs and I was set. 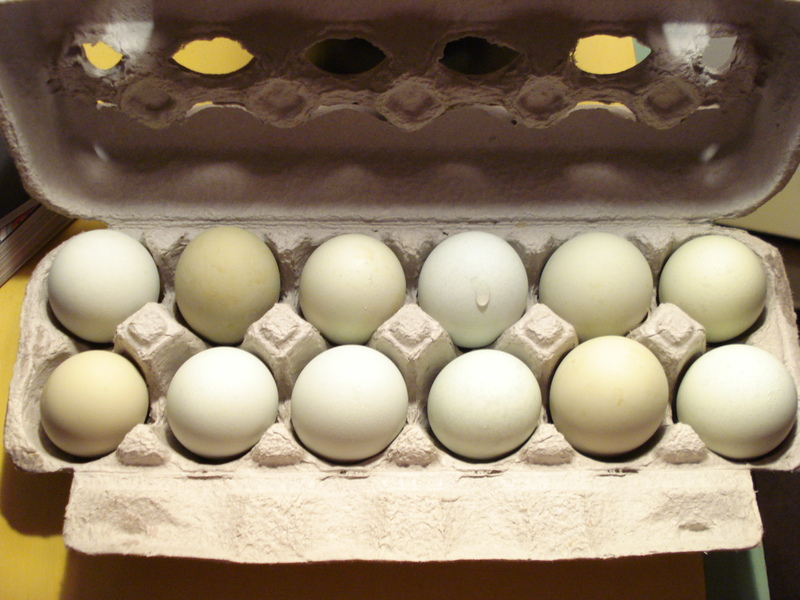 I ran into an old farmer friend who represents a cooperative farming operation in the Kawarthas, and she told me, in a whisper, that she had secret eggs. These weren’t just any secret eggs though, they were BLUE! 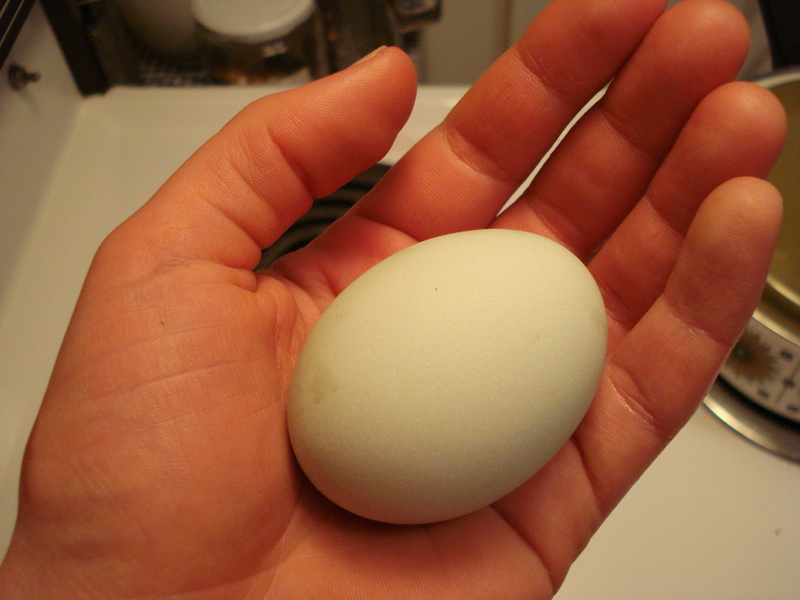 Imperfectly sized, and of many shades of blue-grey, these Ameraucana eggs were gorgeous. I couldn’t resist and had her pack them away under the table into my brown paper bag. I hurried them home and let them rest in the fridge while I went about my day in the magnificent sunshine walking through busy Kensington market, but couldn’t wait to test them out later that evening at our rehearsal dinner. The eggs certainly didn’t disappoint. 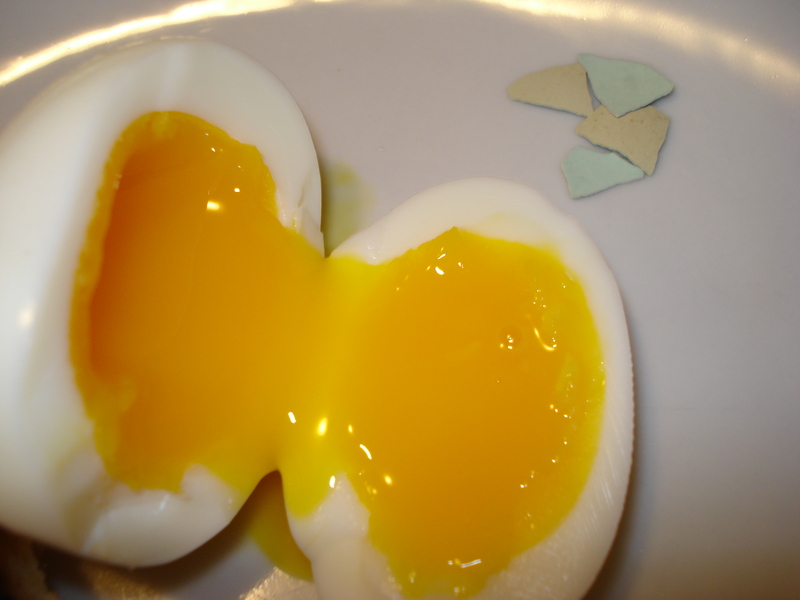 The yolks were bright orange, thick like molasses, and rich in flavour. The three of us couldn’t believe how tasty and beautiful the Ameraucanas turned out to be. Novelty or not, these eggs were delicious and I highly recommend spending the extra couple of bucks if you can get your hands on some. Usually I like to eat two eggs when I decide to eat eggs at all, but with these ones, one is more than enough. So satisfying and aesthetically titillating. In sweet little egg cups alongside the rest of the Salade Torontoise, dressed in a parsley-dense vinaigrette, and Amanda’s roast tomato tarte tatin, we had a winning combination for the audition coming up later in the week.